The third Hong Kong Film Festival (HKFF) returned to Australia after a hiatus last year. The unfortunate break in 2000 may have been a result of the downturn in film production in Hong Kong over the past few years. But if this year’s selection of films is any indication, the films coming from the tiny island, which was once the third most prolific film industry in the world, still possess a unique dynamism. The films included in this year’s HKFF presented audiences with a mere glimpse of the wide range of films produced in Hong Kong over the last couple of years. Nevertheless, the ten films selected reflect the diversity of output that characterises this predominantly commercial cinema. Hong Kong’s extremely prolific film industry has produced innovative filmmakers such as Tsui Hark, Ann Hui, Wong Kar-wai and many others who all work (and struggle) within Hong Kong’s fiercely commercial film industry. Another director recognised within this group is Johnnie To. So it was appropriate that this year’s Festival presented a tribute to To, whose contribution to the Hong Kong film industry has spanned over twenty years. Wu Yen (Johnnie To, 2001) is a comedic period flick that concerns itself with the womanising Emperor Qi (the very versatile Anita Mui) who is involved in an unrequited love triangle with a warrior princess Wu Yen (Sammi Cheung) and a sleazy fox fairy (Cecilia Cheung). The constant competition between the three, in addition to the frequent switching between genders creates a perfect environment for mou-lei-tou humour. Most commonly associated with Hong Kong’s king of comedy, Stephen Chiau Sing-chi, this type of humour can be translated as ‘nonsense’ or ‘ridiculous comedy’ in English. And there’s no doubt that Wu Yen utilises mou-lei-tou to great effect in scenes such as the mock Olympics. However, in addition to its at times downright ridiculousness, Wu Yen also offers a critique of conventional gender roles by problematising female sexuality, presenting the audience with a fluid notion of female gender and sexuality. Although not primarily a comedy, The Mission (To, 1999), does contain moments of subtle humour characteristic of To. The repeated use of a minimal bass-line track, scant dialogue and big name stars such as Simon Yam, Anthony Wong and Francis Ng, suits this particular gangster flick. For a detailed discussion of The Mission, see Stephen Teo’s review in this issue. Unlike the gangster and martial arts film, social melodramas are not popularly associated with Hong Kong’s commercial cinema. Forever and Ever (Raymond To, 2001) probably fits into this category. Involving a much looser and contemplative pace than its action counterparts, Forever and Ever maintains a sensitive approach towards AIDS related illnesses. Containing strong religious overtones, the film focuses on the relationship of friends and family affected by AIDS. Although it provoked tears in some members of the audience, Forever also has moments of light-hearted humour. The film has Sylvia Chang as the mother, whose film Tempting Heart (Sylvia Chang, 1999) was in the HKFF 1999. Ann Hui who I think has a cameo as a nurse in Forever and Ever also had a film at this year’s Festival, Visible Secret (2001). Most popularly recognised as the director of socially relevant films such as Song of the Exile (1988) and Ordinary Heroes (1998) (also in HKFF1999), Visible is Hui’s second film since The Spooky Bunch (1980) that deals with the supernatural. Despite the change in genres, Hui’s preoccupation with the legacy of the past upon the present is still a key theme in Visible Secret. This film is worth seeing on the big screen both for its saturated colour tones and because it’s exemplary of a director who is able to maintain her integrity within a highly commercial cinema. For me, the highlight of the Festival, just ahead of Wu Yen, would have to be Comeuppance (Derek Chiu, 2001). With Johnnie To as producer, this flick should easily satisfy anybody who’s down with the crime genres. The moving image is very slick where the colour red is a prominent feature. The sexiness of the image is also accentuated via the use of a string section that is reminiscent of Wong Kar-wai’s In the Mood for Love (2000). The three protagonists in Comeuppance, a photo-lab technician, a reporter and a cop, form an interdependent relationship that strengthens as the narrative progresses. Gradually, the conventional oppositions of fact and fiction blur simultaneously with the diffusion of responsibility for the three characters in relation to the crimes committed in the film. The blurring of fact and fiction is further represented symbolically through three separate fantasy sequences involving each individual. These three sequences also operate on an extra-textual level where each sequence presents us with popular Hong Kong film heroes – very clever indeed! Three films at this year’s HKFF featured veteran pretty boy Andy Lau in the title role. And no matter what film he’s in, Lau manages to find romance in every one of them. With Sammi Cheung in the comedy-romance like Needing You (To, 2000), with Takako Tokiwa in A Fighter’s Blues (Daniel Lee Yan-kong, 2001) and very briefly on a mini-bus in Running Out of Time (To, 1999)! What’s more interesting though is that there are moments in these films where we are made to feel pity for Lau. In Needing You he is victimised by a bunch of bikies, beaten almost to death in Fighter’s Blues and suffers from a fatal illness in Running. It almost appears to be a necessary aspect of his films whose purpose is to either undermine his handsomeness or to make his pretty boy persona even more endearing! Nevertheless, Andy Lau continues to be successful at the box office both in Hong Kong and Melbourne. Which brings me to my next point on this year’s HKFF. Despite larger audiences for the Andy Lau films, the overall turnout to this year’s Festival in Melbourne appeared less than the previous HKFF. This could be attributed to the fact that some films such as A Fighter’s Blues and Wu Yen have previously been screened at Hoyts Cinema Centre and Chinatown Cinema in Melbourne respectively earlier this year. And although this year’s venue, Cinema Nova, is larger than the previous venue, the Kino, the former lacks the centrality of the latter. But the apparent smaller turnout may just be the fact that the films at this year’s Festival were screened twice as opposed to once. Although Cinema Nova is a great venue, I was annoyed by the fact that for every film, the curtains would shut just when the end credits began to roll. As well as being annoying for some audience members, it’s also insensitive towards the cast and crew of the film. Furthermore, if HKFF organisers are deadly serious about the promotion of Hong Kong cinema they may want to try to obtain films that have much less chance of gaining general distribution at local cinemas. Although it was good that Lan Yu (Stanley Kwan, 2001) was at this year’s Festival, there are others I would have liked to see as well. 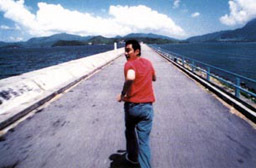 Peripheral films both in style and their characters such as Fruit Chan’s Hollywood Hong Kong (2001) and other social realist films like Spacked Out (Lawrence Ah Mon, 2000) offer interesting insights into Hong Kong culture and society. Additionally, given Hong Kong’s long cinematic history, it is not necessary that the HKFF restrict itself with recent productions. Nonetheless, if this year’s HKFF is any indication, next year’s should be even better. Finally, Melbourne audiences who can’t wait once a year to see Hong Kong films at the cinemas can catch them regularly at Chinatown Cinemas on Bourke Street, Golden Shadows at Cinemedia Treasury Theatre and occasionally at Hoyts Cinema Centre on Bourke.